Last century a British astronomer, Fred Hoyle, remarked that one of the reasons scientific problems persist was because the scientists involved tended only to think with one or two ideas, and in geology that idea was and remains Lyellian Uniformitarianism where the literal present is considered the only key to the past. In this uniform settled science the only natural force is gravity and its various manifestations plus the energy associated with radioactive elements and minerals. So the toolkit contains a gravity hammer and some bottles of radioactive elements and that’s it. We in the Plasma Universe Camp have an additional tool – an electric arc welder. The Earth, unlike the Moon which is extensively cratered, has far fewer craters that are topographically spectacular. Included in this category are more complex shapes called astroblemes and in common with the other craters, are all interpreted to have been formed by the impact of meteors and bolides under the influence of gravity. These impacts are identified by the presence of high temperature and pressure mineral crystals incapable of being formed by any known tectonic crustal mechanism or volcanism. This logic is fallacious for it is the arguing the consequent fallacy. This illogical methodology is common in geology and results in such interesting ideas as flowing water excavating and forming the Grand Canyon in Arizona, for example, simply because at present water is flowing in it, and , ergo, that flowing water must have formed the canyon. Not necessarily. This is not to say that water erosion is a nonsense as the Niagara Falls, marking the border between the US and Canada, are actively retreating, but there appears scant evidence that the basal boulders and cobbles are being slowly attritioned as they move downstream, if at all. And the famous anecdote concerning Lyell when he asked a local how fast the Falls were retreating, to which a local replied over 3 feet per year. Lyell, however, concluded that number as an exaggeration by the local natives, (hubristic arrogance) and that 1 foot per year was more likely, and thus arrived at the present day date for the last ice age of some 10,000 or so years before the present. Remember that at that time Britannia not only ruled the waves but also geology and science in general. And I also recall an anecdote when I worked for the Snowy Mountains Engineering Corporation decades ago that there was no point in building hydropower dams in the Himalayas because after one spring thaw the immediate upstream reservoir would have been filled with boulders and silt. Perhaps, and shades of Viktor Schauberg. Another example of this logical fallacy is the belief that mountain glaciers actively erode the bedrock to form characteristic topographic features such as cirques and corries. This interpretation is the result of noticing that during winter the uplands of the creeks and drainages in the mountains are filled with glacial ice that on melting must have thus formed the peculiar and assumed diagnostic features of glacial erosion. The problem is, however, that glacial ice flows and is not capable of grinding and comminuting bedrock. But since no other physical agent was observed it was logically assumed that the ice was responsible. This simplistic geological modelling I term as Hammerhead Geology, by which everything is explained as if they were nails. This logic is also applied to the impact craters observed on the Earth and Moon. Many years ago I published a comment on a long extinct blog that the lunar craters at the Moon’s equator, being basically circular, implied that the impacting body also had to travel through the Earth before reaching the lunar surface. A colleague mentioned this to some Astronomers on an ABC radio show he was listening to, and told me that the two astronomers were lost for words and were unable to explain the problem. The standard technique to solving insolvable problems is not to think about them in the first place, so the resultant silence was somewhat loud in its implication. And then we have the observation of Comet Schumaker-Levy impacting on Jupiter, a gas giant, or so we believe. The comet hit Jupiter at a glancing angle, exploded, (how remains interesting for the Gas Giant) and probably left no crater. But impact events with gaseous planets are problematical, since how does one impact a gas? So the hammerheads apply their mono-theory to Earthly impact craters and conclude that due to the presence of high temperature and pressure isomorphs of minerals, such as stishovite and coesite or SiO2, and others, that only a meteor or bolide impacted could have formed these high PT mineral phases. Apart from Schumaker-Levy, no one has seen a meteor crater being formed. Even the blast at Tungusta in Siberia, while flattening the forests, did not leave a crater. Well this is not true because some North Kimberley Aboriginals near Halls Creek saw the Wolfe Creek Crater being formed. Or their ancestors did. Geoscience Australia flew an up to date geophysical survey of this crater some years back and the results are quite interesting. I add that I have made field trips to the crater myself, so I have first hand knowledge of its structure and geology. While the crater itself had a small low amplitude magnetic anomaly at its centre, the presence of a radioactive rim was quite unexpected and for mainstream geology remains inexplicable; where did the uranium and thorium come from? The inferred meteorite? 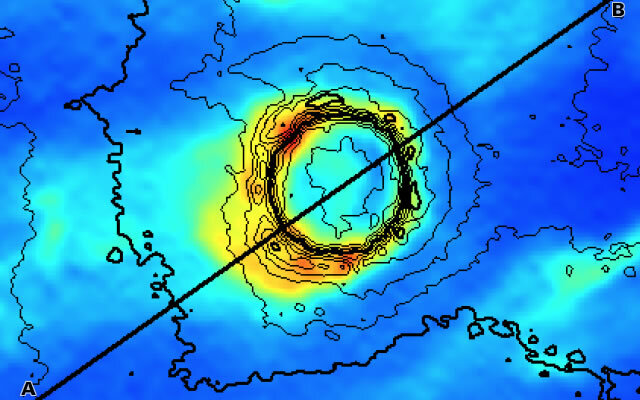 And the magnetic reduce to pole field is shown in figure 2; note the small pin-point magnetic anomaly in the crater’s centre. A digital elevation model superimposed on the radiometric data (Total Count U + Th + K) is shown in Figure 3. And a cross section AB in Figure 4 below. The asymmetry of the radiometric profile is puzzling and is similar to other radiometric anomalies associated with some lamproite pipes further west in the Ellendale Diamond Field. The outstanding problem is explaining the origin of the radioactive crater rim and the conventional meteor impact theory is simply inadequate. However the local Aboriginals assert that their ancestors witnessed the mythical Rainbow Serpent rising out of the ground into the sky at the crater’s location, after having travelled underground to form the nearby Sturt Creek. That creek is a long sand-choked narrow channel. 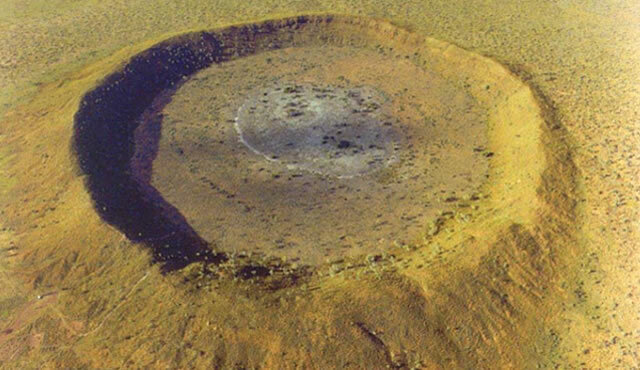 In the Electric Universe model Wolfe Creek Crater is considered an electric plasma discharge crater. Such structures are formed when intense, high voltage electric currents of plasma short circuit between the Earth and its ionosphere by some external object that caused a temporary disruption of the ionosphere. The immense voltages and currents involved derive originally from the Sun and the galactic plasma currents that power it. The discharge between the Earth and the cosmic object was not created locally by electrostatic charge build up between the bodies, but by a short circuit involving the solar wind that instead of sweeping past the magnetosphere, instead passed through the atmosphere and then the conductive wet land surface presumably forming the massive quartz sand deposits from the result of trillions of micro-Z-Pinches associated with the discharge. If the cratering was persistent and of some duration, time enough for the local tribal aboriginals to watch it, then the Z-Pinch effect at the crater would have resulted in prolonged compression of matter and formed high temperature and pressure isomorphs that, once the Z-pinch mechanism disappeared with the dissipation of the electric current, remained as radiogenic minerals/elements. Radioactive elements are simply unstable atomic nuclei in the present immersive geo-electric field. They are the result of intense compressive plasma Z-Pinch processes and not from gravitational accretion nor some original grand explosion event called Creation Big Bang Theory. Wolfe Creek crater is the only impact crater observed by living humans and if the Rainbow Serpent myth is properly accounted for as an electric plasma discharge occurring between the Earth and the Ionosphere by nearby cosmic instabilities caused by intruding comets and planets, as recounted by other civilisations such as the Greek and Roman ones, then it is possible other craters might have similar features. Such is the Dhala Structure in India. The Dhala Structure is enigmatic and was previously identified as a caldera, but more recently as an impact structure from the presence of semi-molten breccias in the peripheral country rock. While the structure is not by any stretch of the imagination a near circular shape of, say, a Wolfe Creek crater or the more famous Meteor Crater in Arizona, the Dhala Structure remains problematical because a crater it is not. It was first noticed, in a scientific sense, during the time of the British Raj, and studied in the late 19th century. The structure is located on an ancient craton as an isolated mesa in otherwise topographically flat surrounds. The structure itself is comprised of flat lying shales and sandstones of the Neoproterozoic Vindhyan Supergroup resting on top of granitoids, diorites and other rocks of the crystalline basement. A geological map is below. It is a bit of a puzzle how an asteroid or bolide could impact this area leaving a slightly eroded structure that seems to have been formed by the erosion of its surrounds leaving an upland or mesa-like topographic remnant. It is plausible that the whole area shown in Figure 6 above could have originally had the crystalline basement covered by the Vindhyan Supergoup sediments of shale and sandstone, the Neoproterozoic land surface onto which an asteroid subsequently impacted but there’s no impact crater! How can this be Obiwan, Yoda might have asked? The interpreted impact caused partial melting of the rocks underneath the Vindhyan Supergroup, mapped as melt breccia in Figure 6, leaving behind diagnostic tails of thermally and structurally stressed mineral species. It is on this misinterpretation of the presence of Stishavite and Coesite in the melt breccias that has resulted in the proposed meteor impact model. Assuming the mapped facts as shown in Figure 6 above, originally the whole area was covered by shales and sandstones of the Vindhyan Supergroup of interpreted Neoproterozoic age. How these sediments originated is not discussed here for now. Then a plasma impact occurred elsewhere from the result of a massive electric plasma discharge, as possibly discussed in the Indian sacred texts as a thunder or iron bolt, between the Earth and some cosmic interloper or “god”. Once the earth-ionosphere circuit became established electro-machining proceeded eroding the water logged Vindhyan Supergroup sediments, stripping the land surface and exposing the crystalline basement. This process would have had the visual characteristics of a large bright thin tower of arc-mode plasma moving erratically over the land surface, much in the manner of the familiar Van De Waals laboratory experiment showing electrostatic short circuits between two conductive metal sphere. The products of this erosion were deposit as the surrounding mapped recent or Quaternary deposits. The sediments might well have been water logged and if so then electric currents would have spread out laterally under the landscape and the erosion extensive. Activity ceased until dissipation of the initial forcing current occurred when the resistance of the dried out crystalline basement became too much of a load to the rainbow serpent agent. In its dying gasps these phenomena may have just started melting the crystalline basement and forming the melt breccias when the forcing current finally dwindled, leaving the enigmatic remnant mesa known as the Dhala Structure with patches of melt breccia at its rim lying on top of the exposed crystalline basement. There’s another problem with this particular structure – its convoluted rim. Simplistic single shot bolide impacts would leave a crater similar to the Wolfe Creek Crater (see above), but the Dhala Crater is anything but a simple circular crater. In fact it is not an impact crater at all. It’s called an impact crater because our hammer-headed geologists are only thinking with a simple tool box of ideas, gravity and radioactivity. Add the physics of plasma and the inexplicable become explicable. So the impact origin of the Dhala Structure is a simple interpretation of the melt-breccia mineralisation based on assuming that the stishavite and coesite in the melt breccias are caused by meteor impact, our ever active logical fallacy of arguing the consequent since no other geological agent is thought possible. Impact yes, but not of a meteor but a massive plasma electrical bolt hitting the Earth’s surface. While the present-day landscape and climate is dry, and thus highly resistive, previous states might have involved a sediment-free region of deeply weathered cratonic rocks, such as the remnants of the Yilgarn Craton in Western Australia, in which initial easy lateral passage of electric currents could occur, thus causing immense erosion and damage at the start of the electric-plasma event. Given the water logged regolith evaporation of this ground water would have resulted in an atmosphere charged with wet electrically conductive clays and silts, most of which might have been instantly transformed into small spheres or grains of quartz or some other, chemically plausible mineral phase. An intensely humid atmosphere, coupled with clouds of electrically charged particles, and brightly illuminated arc-mode plasma discharges would have generated multiple visual effects such as rainbows, leading to the historical memory of rainbow serpents having formed the existing topography by the Australian Aboriginals. One wonders whether the Indian Dravidian peoples had similar traditions. 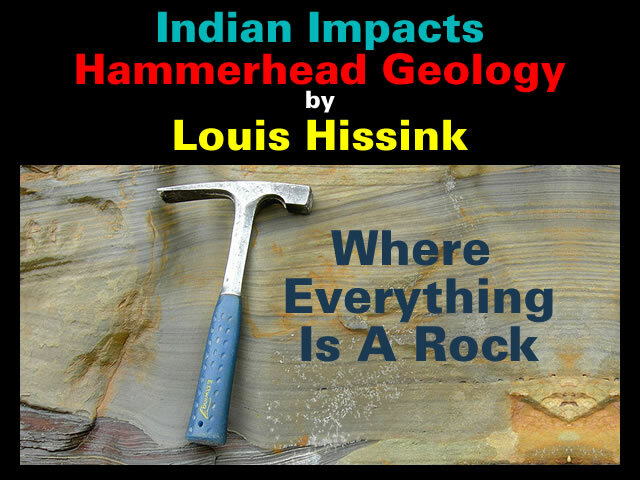 Gallery | This entry was posted in Catastrophism, Electric Universe, Geology, Guest Authors, History, Indian Impacts. Bookmark the permalink. First thought was about the moisture,the fact that the Sahara area was so recently lush and the earlier mentioned water at a negligible depth below the southern Arabian Peninsula. This is somewhat besides the point with respect to thread subject. But with reference to the: quote “the fact that the Sahara area was so recently lush”, there have been several disturbances in the Holocene with marked and abrupt changes that have left their mark in proxies. The source is cataclysmic Earth changes, and the dates are quite sharply delineated. The events are the result of major seismic shudders. Thanks for this excellent review Louis. If the observed radioactivity in the crater rim is due to uranium and thorium then it is unlikely to be actual meteorite material as they are somewhat depleted in radioactive elements compared to the earth’s crust, …about 0.01 ppm for meteorite material and 1.4 ppm for the crust. Of course these are average figures and in the crust at least, local abundance can be higher. It is more likely that the radioactivity is crust related, no? For the benefit of readers I will mention that the crater formation process is not restricted to impact activity. I’ve more data on the surficial distribution of U, Th and K from a geophysical survey I commissioned years ago over the east of the Ellendale Lamproite field, and open file on the Department of Mines and Petroleum WAMEX database – either under Ellendale Resources NL, or Dioro etc. Search for author (me) should get it in any case – suffice it to say here that the radioactivity is associated with the ferruginous pisolites (usually black in colour) in the laterite. For example near Gibb River Station in the Kimberley there are patches of radioactive material on the landsurface and using a quad-bike to check these things out again leads to the radioactivity coming from surface deposits of pisolitic laterite. The conventional view is concentration of these element from chemical weathering over extended periods of time. That’s the Lyellian view. If externalities are allowed, then I would wonder if these silcrete deposits are the leftovers of persistent sheet-lightning restricted to the wet surface involving plasma discharges associated with the electro-machining of the land surface, as implied by the persistent Aboriginal explanation of the land surface being formed by the Rainbow Serpent. It needs stressing but the only reason this feature is called an impact structure is because of the presence of high PT mineral phases in recrystallised melt. Since plasma Z-Pinches are not at all considered, no alternative explanation is possible. Unfortunately invoking the physics of the plasma universe means ditching creationism, both literal and liberal, the liberal version being the present day mainstream paradigm compatible with the Judeo-Christian culture of the West.